Is there any paperwork or document for the mechanical systems of 137 Kennedy St W, Aurora, Ontario? I need more information about the property at 137 Kennedy St W, Aurora, Ontario. How ist the neighborhood, location and nearby amenities for 137 Kennedy St W, Aurora, Ontario? I have questions about the roof, foundation, insulations and mechanical issues of 137 Kennedy St W, Aurora, Ontario? I need more information about property details. What's wrong with this house? Is this a short sale? Is there any maintenance for 137 Kennedy St W, Aurora, Ontario? What is this property worth in today's market? What are "closing costs", and how much? What steps should I take when looking for a home loan? What price home can I afford? Is my credit good enough to buy this house? What are the best mortgage options for me? How flexible is the seller on the asking price? How low can I consider offering for 137 Kennedy St W, Aurora, Ontario? 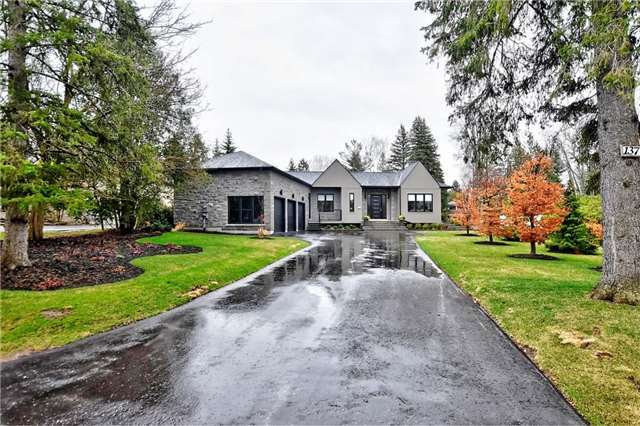 Spectacular Architecturally Designed Bungalow Infused In Modern Elegance, Features Gourmet Kitchen With Quartz Counters & 10Centre Island To Satisfy The Culinary Enthusiast & Family Gatherings. Bright Open Concept Principle Rooms, Multiple Walk Outs To Private Patios & Gardens, Quality Craftsmanship Is Evident Here With Hand Cut Stone, 8 Doors, Soaring Ceilings, Cabinetry By Mutti, 7" Northern Plank Flooring, Vaulted Triple Car Garage & So Much More. Includes: All Jenn-Air Appliances, All Elfs, All Blinds, Gdo (3), Washer/Dryer, In-Ground Sprinklers. Exclude: All Drapery, Bike Rack In Garage & Wine Racks.